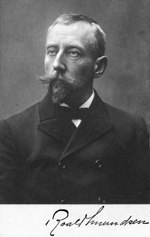 Amundsen is a name synonymous with polar exploration. Better known as the first man to reach the South Pole, the Norwegian also commanded several other significant Arctic expeditions. As he wrote in his Northwest Passage book's introduction: It is in the service of science that these numerous and incessant assaults have been made upon what is perhaps the most formidable obstacle ever encountered by the inquisitive human spirit, that barrier of millennial, if not primæval ice which, in a wide and compact wall, enshrouds the mysteries of the North Pole [Vol. 1, p.2.]. More directly, Amundsen was stimulated by his childhood memories of the failed Franklin expedition of the 1840s and the successful Northeast Passage transit of the Vega by the Swedish geologist and explorer A. E. Nordenskiöld in the 1870s. 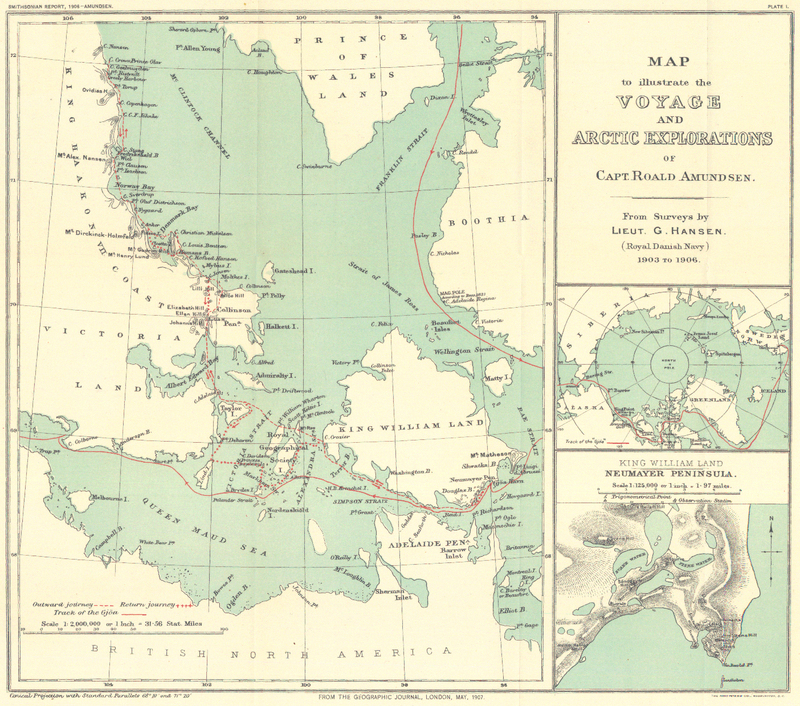 In 1899, as mate in the Belgian Antarctic Expedition under Adrien de Gerlache, he proposed combining his boyhood dream of completing the Northwest Passage with the scientific aim of locating the present site of the Magnetic North Pole. 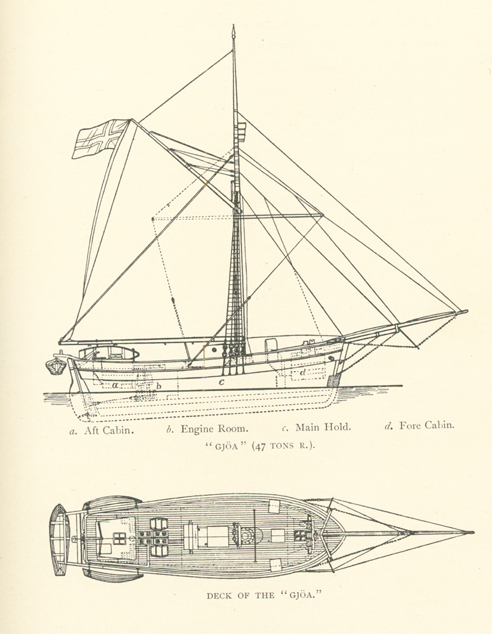 He won the approval and aid of the veteran Norwegian explorer and scientist Fridtjof Nansen, and raised money, acquired equipment, and bought and outfitted a former herring-boat named Gjöa [see image of it from the book]. Weighing forty-seven tons, the little sailing ship boasted a 13-hp engine, stowed enough food and supplies for five years, and carried an experienced Arctic crew of seven, including Amundsen. They cast off from Christiania [now Oslo] on the night of 16 June 1903. In creeping up the west coast of Greenland, they were fortunate to have missed the early ice, and reached Dalrymple Rock (their farthest North, latitude 76° 28'20" N), where Scottish whalers had deposited some stores for them, on August 15. From there it was just a week's sailing across Baffin Bay, through the opening of Lancaster Sound, to Beechey Island, where they anchored in Erebus Bay. After exploring the barren island (they found the memorials in good order), scavenging through the old Franklin depot, and completing their magnetic observations, they departed on the 24th, sailing and motoring down Peel Sound and Franklin Strait, past the eastern side of King William Island, through Rae Strait, to the safety of a small harbor on the island's southeastern corner that they christened Gjöahavn [today's Gjöa Haven]. It was the middle of September. They had survived a fire in the engine room and a grounding on a submerged reef, and had depended on dead reckoning due to the compass's fluctuations around the magnetic pole. Amundsen decided to winter there to concentrate on magnetic work. For almost two years, Gjöa Haven was their home [see map of their activities during that time] .Thoroughly interacting with the local Inuit and adopting their clothing, Amundsen's party participated in dog sledding and seal hunting activities in the winter and kayaking and net fishing during the summerin addition to fulfilling their scientific tasks. A major sledge trip was undertaken in the spring of 1905 by second mate Helmer Hansen and first engineer and meteorologist Peder Ristvedt to the eastern coast of Victoria Island along the remaining uncharted region. They reached their furthest point north, which they named Cape Nansen, on May 26; a month later they were back at the ship, having covered 800 miles. Gjöa and its crew finally departed from Gjöa Haven on 13 August 1905. Though there was much ice in Queen Maud's Gulf, Dease Strait was completely clear. However, serious pack ice began advancing down on them from the east near Cape Bathurst. Soon after, they met two American whalers heading to Herschel Island, which was their destination as well, but the ice stymied them, and they were forced to spend the winter at King Point, where the schooner Bonanza from San Francisco had been beached due to damage. Desiring to post mail and wire a telegram of his accomplishment, Amundsen joined the whalers' mail run from Herschel Island to Eagle City (on the Yukon River); they left on October 24 and reached Eagle City a little more than a month later. Waiting for mail from home, he stayed in Eagle City for another two months, but was back at King Point on 12 March 1906. Gustsav Wiik, Amundsen's assistant for magnetic observations, got very sick and died at the end of March and was buried at King Point where their magnetic instrument stand had stood. Ice conditions allowed the group to leave on July 2, but then they were grounded in the harbor on the east side of Herschel Island for three weeks. They made several attempts to continue their journey west, but each time ice forced them back to Herschel Island. They made their final escape on August 9. Along the coast of Alaska they dealt with heavy fog and wind-driven ice; they damaged their propeller shaft near Cape Simpson, and while the mainsail was being set, the gaff brokefortunately, these troubles were coming at the end of their trip. At Point Barrow, Amundsen received a letter of invitation from the people of the town of Nome. Using the opportunity to obtain a new gaff, they arrived at Nome on 31 August 1906: the celebration there marked the official end of the first successful Northwest Passage voyage. Building on his Arctic experience, Amundsen later went on to conquer the South Pole, arriving there on 14 December 1911, thirty-five days before Robert F. Scott.